Join Fogo Azul NYC - Want to learn to play drums? Join Us and Become a Performer! Want to learn to play drums with us? Fogo Azul is currently accepting new members, previous drumming experience not required. We strive to make drumming accessible to women and TGNC individuals, no matter their skill. We take absolute beginners and give them the tools to drum. For thousands of years women were often relegated to dance while the men played the drums. We’re taking that stereotype and breaking it. We seek to bring music and dance to all communities regardless of ability to pay for our shows. Our music is Samba Reggae based, which originates from the state of Bahia in Brazil. Our members play this music with pride, our Artistic Director traveling to Salvador de Bahai 4 times to play and learn in Carnival with Cortejo Afro, an AfroBloco, as well as Recife to learn the rhythms of Pernambuco. Learn to play Brazilian drums! Learn to play drums with us! We are looking for well rounded people who understand group dynamics of a performance troupe. Drumming/music/dance experience is helpful, but not required! FogoAzulNYC is a performance group, a band. Rehearsals are essential, as are performances. If you are someone who leaves town often, has many other commitments, or often has sudden schedule conflicts, this may not be the group for you. Our rehearsals are on weeknights from 6:30pm to 9:30pm at schools in Manhattan, Queens, and sometimes Brooklyn. Our schedule is not a set specific evening of the week, rather rotates to give those who attend school or do other things on set nights the flexibility to also participate with us. We sometimes have weekend afternoon rehearsals. We can have gigs on weeknights, weekends, late nights, early mornings, depending on what we are asked to do. We have an attendance policy requiring attendance at 75% of rehearsals in a month, and 50% of gigs in a month. Rehearsals are run in the traditional Brazilian style of repetition. We strive to make drumming accessible to women no matter their skill. We take absolute beginners and give them the tools to drum. Additionally we believe that music and rhythm is in every human and animal on the planet, and if you give them the means, they will find their inner rhythm. For thousands of years women in many cultures were not allowed to touch a drum. Women were often relegated to dance while the men played the drums. We’re taking that stereotype and turning it on its head. 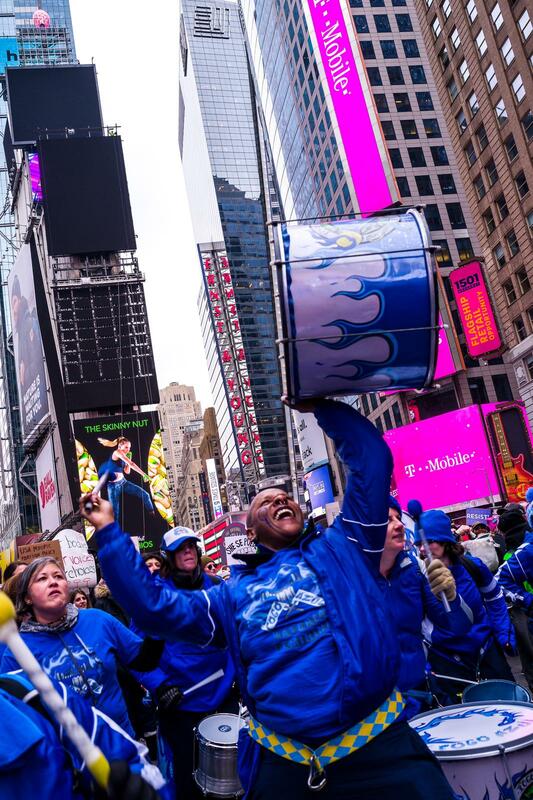 Formerly known as Batala New York City, FogoAzul NYC has now taken the mission of Batala New York City and expanded it to be less profit seeking and more community oriented. We seek to bring music and dance to all communities regardless of ability to pay for our shows. Spreading the culture of Salvador de Bahia, Brazil is our passion. Our music is Samba Reggae based, which originates from the state of Bahia in Brazil. Our women play this music with pride, our Artistic Director traveling to Salvador 4 times to play in Carnival with Cortejo Afro, an AfroBloco. Being a member of a band requires everyone to work professionally with other adults, communicate effectively, and treat fellow band members with respect. We love celebrating our diversity and appreciation of each other for differences and quirks! We are a group of people working together and supporting each other to accomplish a shared goal: PERFORMANCES. Please keep in mind that FogoAzulNYC does not function as a collective, nor through consensus-based decision-making. There is one Artistic Director who is responsible for band decision making with input from the band as requested/offered, all in the best interest of the band. FogoAzulNYC membership requires a $35 monthly fee per member to cover operational costs. There is a one time, non-refundable joining fee of $20. You will be given a drum package: drum, sticks, and a belt on loan to use which will require a cash or check security deposit in the amount of $185 per drum package. This will be placed in a secure bank account and will be given back upon leaving the band once you return the equipment. This equipment is to be taken with you, and is your responsibility to maintain, clean, and take care of. Upon leaving the band you will have 7 days to return the drum, belt, and sticks. There may be special circumstances where you can use your own drum, belt, or sticks, however this will be on a case by case basis only. These are NOT classes or lessons, they are focused rehearsals on the specific musical repertoire of FogoAzul NYC and Grooversity. Reliable internet access and email address that you check regularly is required for membership as our primary communication method is by email. Having a Facebook account is encouraged, but not required. Do you have any musical, dance, or other type of rhythm training? (This is not necessary to join, the group, we are just curious!) If so, please explain as best you can. Have you ever been a member of a musical group or a sports team? Or, a member of a team that works together towards a shared goal? Tell us a little about your experiences as part of a team/group. Are you genuinely available on weeknights for rehearsals, and weeknights and weekends for gigs? We love new members, but attending rehearsals every week is necessary. We rehearse on rotating weeknights in various places, and have peformances on some weeknights, but more often on Saturdays and Sundays. Did you read the paragraph about joining? Any questions? Anything else you would like us to know? Want to learn to play drums? Look no further! Learn to play drums with us! We are looking for well rounded people who understand group dynamics of a performance troupe. Drumming/music/dance experience is helpful, but not required! Our rehearsals are on weeknights from 6:30pm to 9:30pm at schools in Chelsea and the East 20’s, Manhattan. Our schedule is not a set specific evening of the week, rather rotates to give those who attend school or do other things on set nights the flexibility to also participate with us. We sometimes have weekend afternoon rehearsals. We can have gigs on weeknights, weekends, late nights, early mornings, depending on what we are asked to do. We have an attendance policy of being at 75% of rehearsals in a month, and 50% of gigs in a month. Rehearsals are run in the traditional Brazilian style of repetition. There is limited time for questions/discussions during rehearsal, however time will be provided for such at specified intervals, or for immediate clarification. Learn to play drums, with each other! Being a member of a band requires an ability to work professionally with other adults, communicate effectively, and treat fellow band members with respect. We love celebrating our diversity and appreciation of each other for differences and quirks! We are a group of people working together and supporting each other to accomplish a shared goal: PERFORMANCES. FogoAzulNYC membership requires a $25 monthly fee per member to cover operational costs. There is a one time, non-refundable joining fee of $20. You will be given a drum package: drum, sticks, and a belt on loan to use which will require a cash or check security deposit in the amount of $185 per drum package. These are NOT classes or lessons, they are focused rehearsals on the specific repertoire of FogoAzulNYC and Grooversity. Reliable internet access and email address that you check regularly is required for membership as our primary communication method is by email. Having a Facebook account is encouraged, but not required as there is a private Facebook group we use socially to communicate.